this movie was really awesome . 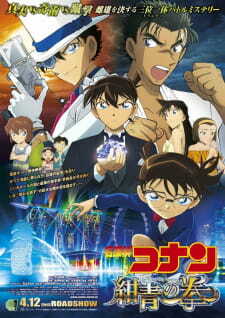 a really chilling corpse scene in the middle and great comedy as well for a detective conan movie . the murder motive was also good and the action , romance and music was fantastic . coming off of the recent bombshell revelations in the manga regarding the identity of the boss of the BO and many other serious developments , this movie was perfect. heavily recommended for any DC fan . the art and animation was fantastic and the new guest characters were also very engaging. kid and conans bromance( they even sleep in the same bed) was enjoyable . ran very smartly tricked kid into making him believe that she thought he was shinichi . makoto and sonokos romance is really good as well and not to mention no DC movie is complete without the bomb blasts.